“This year will be different” you think to yourself as you sit at your computer after hours, envisioning the new year. “I’m not going to put off what I know needs to be done…it’s time for some REAL growth!” You briefly reflect on the past year, specifically remembering what you had intended to do in order to spread the word about your practice. Marketing is always something you’ve wanted to do well, but something always seems to come up to occupy your time, energy, and funds. “This year HAS to be different” you mutter out loud, beginning to rack your brain for ideas. And not only will this year be different, but will it be a GOOD different? Well, it certainly CAN be…and here’s a tool to help ya do it! 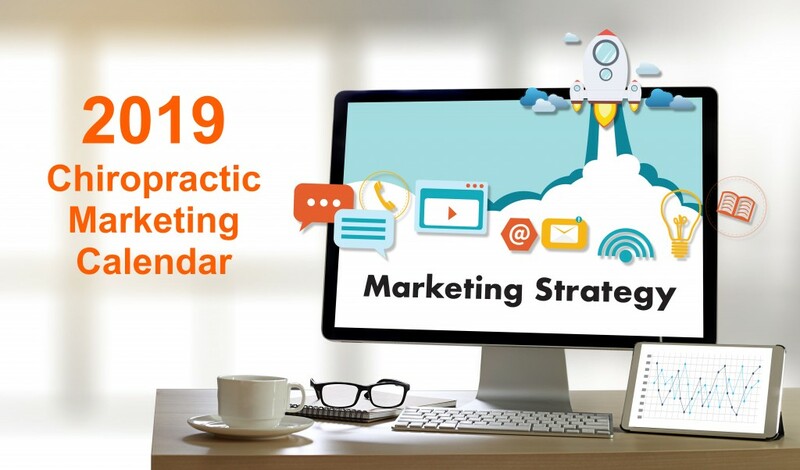 Download our Chiropractic Marketing Calendar and take charge! But, that’s just the beginning…you’ll need to fill it in with creative (and helpful) marketing ideas. Don’t worry, we’ll help you do this AND provide resources for you to fulfill your plan…how cool is that! If you check out your marketing calendar, there is a layout of the month that you can print out and hang up on your wall. Keep it front of mind! 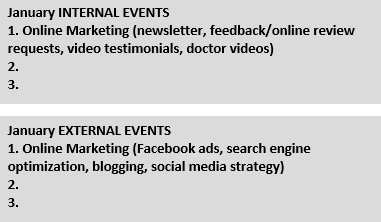 You will also see a section for each month that has three internal marketing spots and three external marketing spots for you to keep track of your marketing initiatives for that month. These three types of marketing, when done effectively, will feed into each other and will give you a steady stream of high-quality new patients coming into your office throughout 2019. This type of marketing strategy will also help you retain the patients you have and reactivate inactive patients. 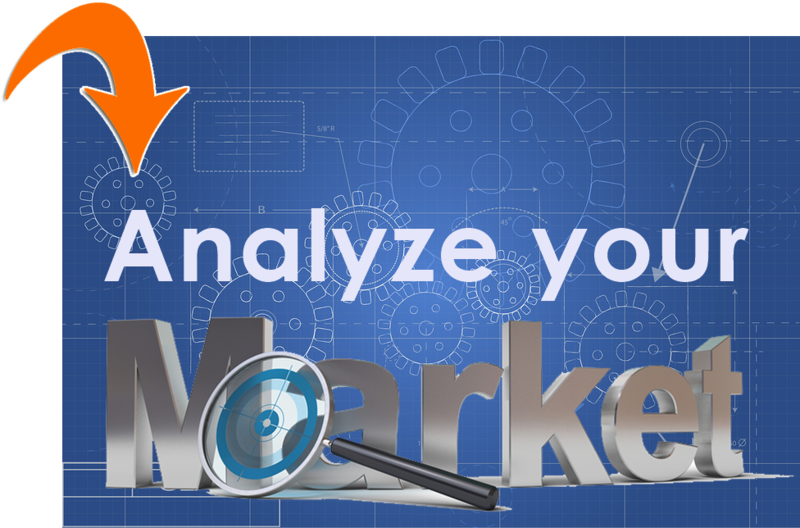 Online marketing when done effectively is both an internal marketing approach and an external marketing approach. To implement a comprehensive (and integrated) online marketing program it can be very complicated and very time-consuming for you or your staff. 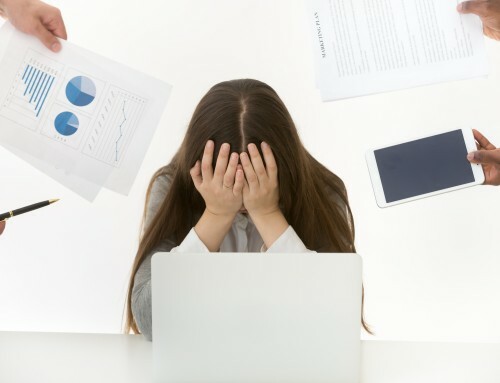 For the cost of a part-time team member, we can help you implement a comprehensive and integrated online marketing program to support all internal and external marketing initiatives you will be doing in 2019 as well as tackling online marketing. It works (and makes it easier on ya)! Let’s start with some internal events. Internal marketing should all be focused on patient education and internal events in some way, shape, or form. Patient education is the number one way that doctors have been effectively generating new patients internally according to our 2018 Upper Cervical Practice Survey. So, you’ll want to make sure that you have an ongoing patient education strategy for your upper cervical practice. 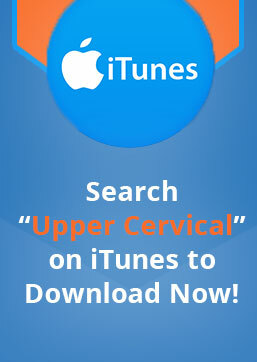 One of the easiest ways to do this is to get the Upper Cervical Patient Education Station. This is a series of educational flyers that can be used to educate patients on an ongoing basis. 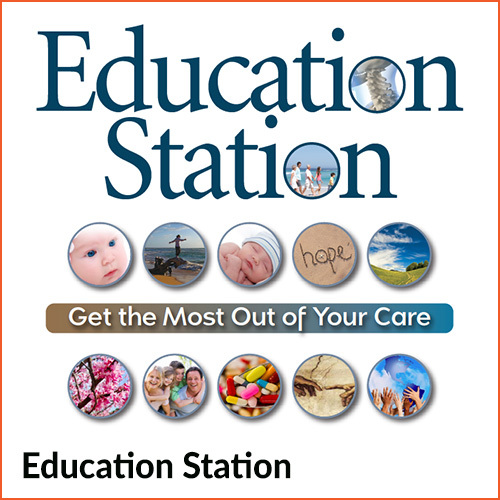 Included with this program are 15 UC educational tidbits, 3 patient quizzes, a welcome letter, protocol to implement and signage art to print out to announce the Education Station program. Another excellent internal marketing promotion to utilize with the education station is the Certificate of Health Program. The certificate of health program is a way that you can make it easy for your patients to refer others. 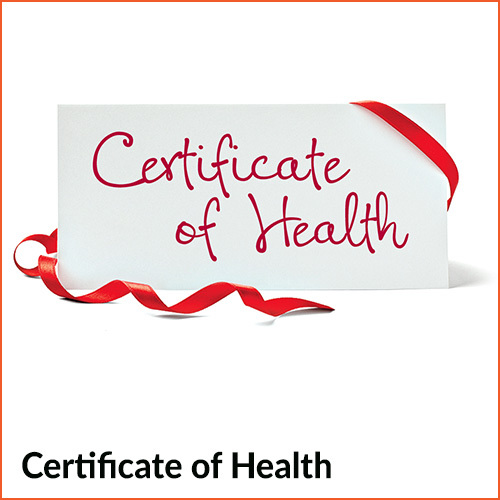 Anytime you have a patient who mentions a family member, friend or coworker you give them a certificate of health which provides that family member, friend or coworker with a discounted first visit with an expiration date. 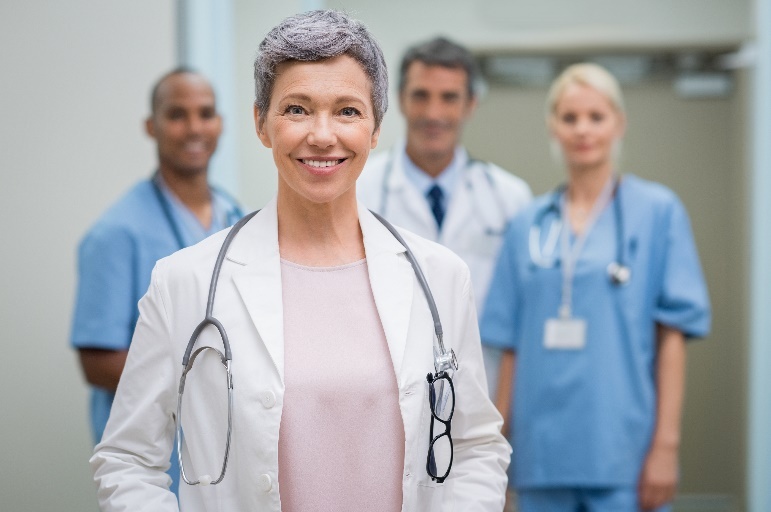 The certificate of health program is a very effective way to improve your referral conversion as you give someone an incentive and urgency to come in and see you. We have an entire program on how to effectively do the certificate of health program along with the graphics and implementation if you…easy peesy! Just click on the image below. Next, you’ll want to decide what 2 external marketing outreach initiatives you will be implementing in January 2019. Again, don’t forget about the 101 Chiropractic Marketing Ideas blog…use your vision and don’t be afraid to try things. 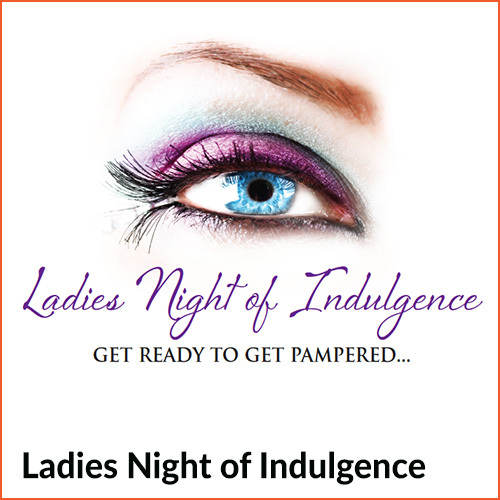 1 of the best external marketing outreaches I’ve seen over the past several years is what’s called the Ladies Night of Indulgence. This outreach program is very effective at attracting more women into your practice. Women are the primary health care decision-makers for their families and it’s very important that you attract women into your practice consistently. If you want to learn exactly how the ladies night of indulgence outreach program works, including an implementation protocol, sponsor letter that you can use to solicit other businesses to be involved, and personalized flyers that you can use to promote the event, grab our Ladies Night of Indulgence execution plan by clicking the image below. 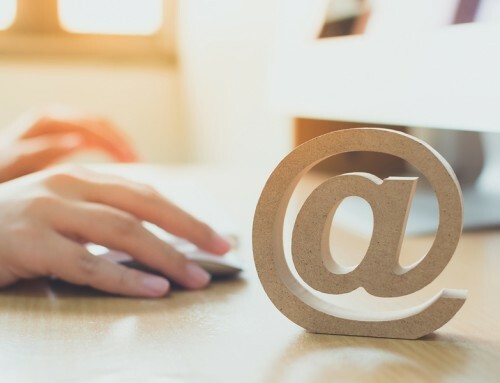 If you decide to implement this external marketing outreach make sure you are thoroughly promoting this through your online marketing and email and social media formats along with your internal promotion. Failure to promote effectively could result in lesser results. 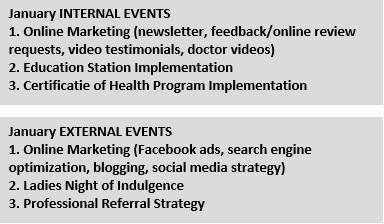 Another great external marketing outreach initiative to start in January is generating professional referrals from other health practitioners. But if you’re looking for a resource to help you in this area I want to recommend a resource from Dr. Noel Lloyd which is a PowerPoint presentation you can utilize when talking with medical doctors in a lunch and learn format. Visual aids always help! Once you lay out a solid plan for success in January next move on to February and March etc. You’re on a roll! Remember, have fun with this, use the strengths of your team, and reach out to us if you would like any help. 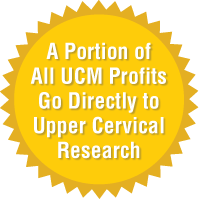 Dr. Bill Davis wrote a fantastic book, “Upper Cervical Practice Mastery”, which covers a TON of practice success secrets, including internal, external, and online marketing. It’s basically an upper cervical handbook. You can take a peek at it and grab the first 3 chapters by clicking here. Plan for your greatest success in 2019 and watch it become a reality! 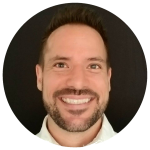 Tony Hook is the Director of Sales and Marketing for Upper Cervical Marketing. His goal is to help Upper Cervical Doctors have the best practices possible.